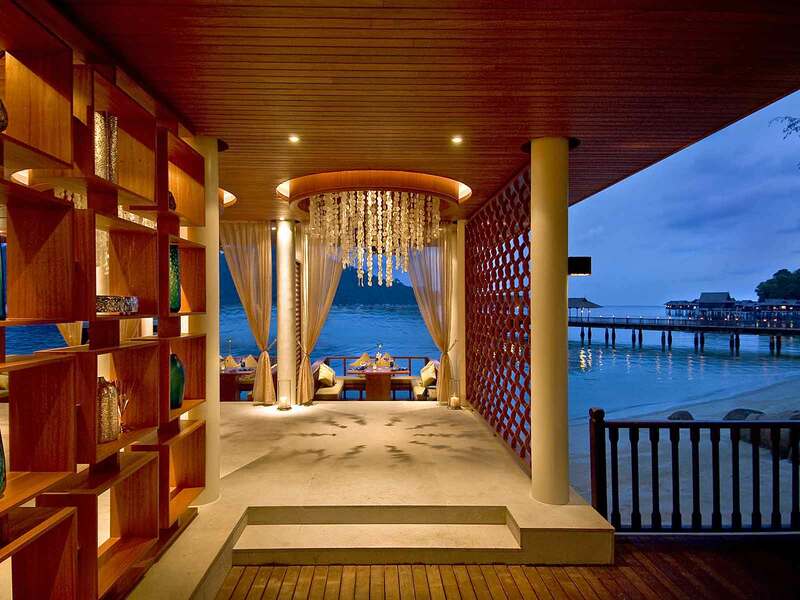 Today’s *Honeymoon Heaven* inspiration features the spectacular *Pangkor Laut* spa resort in Malaysia. We had the privilege of visiting this wonderful location during March of this year. The hotel has previously won Conde Nast’s prestigious ‘Number One In The World’ award, which is quite something! Pangkor Laut is situated on the serene island of Pangkor, on the West coast of Malaysia. It was also the favoured spot of the operatic legend Luciano Pavarotti. I have had the pleasure of staying in many beautiful resorts around the world due to my husband working in the travel industry but Pangkor Laut has really stood out. The island only contains one hotel and of its 300 acres of lush beauty, only 20% of the island is designated for the hotel. It preserves the natural beauty of the island, is committed to eco friendly living and protecting the wildlife that inhabit the island. From Kuala Lumpur International Airport, we embarked upon the three hour drive to Pangkor. On arrival, we arrived at the harbour, we were greeted with cooling fruity drinks and cold towels. Our luggage was loaded on board and we took the 15 minute journey over to the island, which felt like we were in some kind of James Bond movie. It was a refreshing ride and a nice break from the heat and when we arrived it certainly did not disappoint! We stayed in the most incredible overwater villa standing in clear turquoise waters. The deck was incredible to relax on and had the most fabulous backdrop of lush green hills. It was the perfect setting for a spot of sunbathing or just to take in the glorious views. One of my favourite features was the bath, which had beautiful wooden doors that could be opened to take in that glorious view. Each day the lovely housekeeping staff would adorn the crisp white sheets with fresh flowers and specially folded towels. The elephant was my favourite shape created. The island hosts the most incredible private beach – Emerald Bay. This is a short walk through the lush rainforest setting or the resort provides minibus transfers every 15 minutes if you are not feeling very active. Emerald Bay is appropriately named due to the serene green waters – it really is like a paradise island. What I loved about it was just how tranquil it was. Sun loungers and hammocks are hidden away amongst the trees, so it really doesn’t have the feel of a resort. We enjoyed the most lovely walk along the beach to view the imposing boulders and to take in a different view. It is not a huge stretch of beach but it certainly is beautiful. I am a huge fan of planning a couple of our holiday days around sunrises and sunsets, much to my husband’s dismay! My pleading line often begins with…’Just think of the pretty photos darling’. But my gosh even he was convinced they were worth seeing this time! The sparkling sun rose with a shimmering light beaming down on the sea. The sun was so bright and warm, even so early in the morning that it was quite hard to see or even get the camera to focus at times. The award-winning spa village is an idyllic haven offering an extensive programme of treatments created for physical and spiritual well being. The village is set in lush gardens complete with pretty flowers, calming fountains and an abundance of butterflies and birds. Before enjoying a Malaysian massages, we used the serene spa facilities, including the lovely swimming pool. Our therapists greeted us with a refreshing lemongrass-grass drink before escorting us for our Bath House Ritual. This is inspired by an array of Asian influences, including Malaysia, China and Japan. 1. Chinese Foot Pounding – our feet were washed in warm water filled with flowers and then ‘pounded’ with a small wooden mallet to increase circulation. This wasn’t as painful as it sounds! 3. Japanese Wash House – upon entering the wash house, small stools stand next to the floor standing showers. The Japanese goshi cloth is given to exfoliate. After exfoliation, the warm Rotenburo stone bath is a lovely way to relax with a cup of refreshing green tea. 4. Shanghai Scrub – the therapist uses an exfoliating sponge to scrub the body followed by hot water to wash it off. We were awoken each morning by the sound of the macquarie monkeys making their rather loud squawking noises but there was something equally as charming about it. Beautiful birds, including hornbills could be seen from the trees. Monitor lizards were basking in the sunshine on the shore and the crystal clear waters showed a variety of colourful fish. Pangkor Laut has two fabulous swimming pools. The first often provides that picture perfect brochure shot of the resort with its bright blue waters framed with a line of palm trees overlooking the clear sea, green hills and wooden overwater villas. This pool has a fabulous poolside restaurant serving a great range of snacks, light lunches and drinks. Staff are on hand to provide buckets of ice cold water and ice lollies made from fresh fruits and flowers. The second set in the spa village also overlooks the sea and is has a real serene feel to it. Both pools are well located and have been so well designed, that you often feel like you are there alone. Perfect for a spot of relaxation! The resort hosts five fabulous restaurants offering an array of culinary delights. We had a special meal one evening with the fine dining experience, which had a more romantic feel, perfect for honeymooners! Chapman’s Bar – Emerald Bay has a charming little restaurant with fabulous sea views and some great light lunches, including burgers and seafood to enjoy. They also do wonderful milkshakes and ice creams! Uncle Lim’s restaurant offers a fabulous array of oriental cuisine in an open sided hilltop pavillion. The setting is just perfect at sunset! A wonderful buffet breakfast is served at Feast Village, which has so much choice you certainly won’t go hungry! This is also open for dinner in the evening too with a wonderful a la carte menu. We tried the Malaysian platters which were fabulous, consisting of curry, rice and other delicious treats. Fisherman’s Cove is set in the spa village and is the fine dining option of the resort. It has an excellent range of seafood dishes, French and Italian cuisine and hosts wonderful views also. The Straits Restaurant has been designed very well with the dining booths and its setting in the rocks overlooking the beach offering wonderful set menu platters. We also had the most amazing picnic experience on Emerald Beach. The lovely hotel staff organise this and is a rewarding treat after a jungle trek or just as a romantic honeymoon treat. We thoroughly enjoyed the walks exploring the rainforest led by conservation expert and saw the fantastic array of wildlife on the island. It was a pretty hilly walk but the views back over the island are certainly worth it! The resort also offers a boat transfer over to Pangkor Island where fishing boats, colourful homes, food markets and noodles are in abundance! 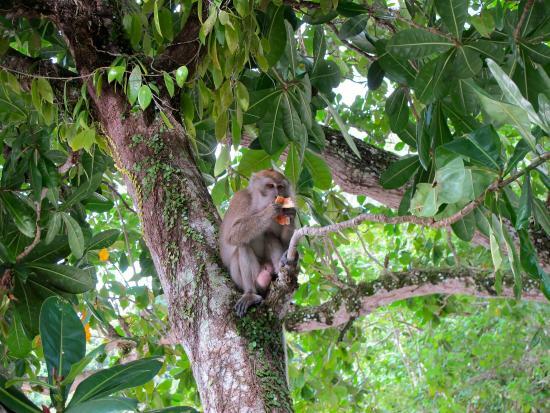 This tour explores the island well and gives you an insight into Malaysian life. Pangkor Laut really is the most incredible of settings and would be an ideal honeymoon/anniversary trip location. We thoroughly enjoyed our stay here and would go back in a second! 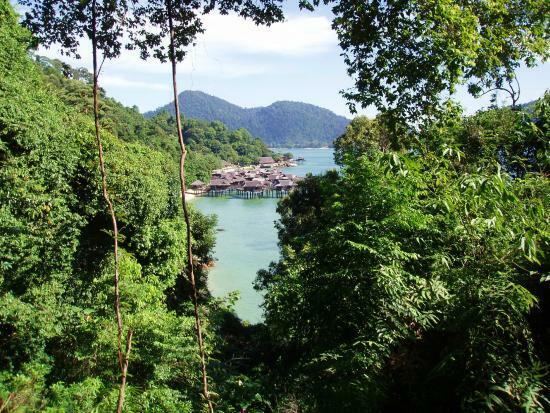 A trip to Pangkor Laut would be perfect for a couple looking for a beautiful setting, to be close to nature and to be treated with a tad of luxury.